The facility is part of the company’s plans to create 10,000 American jobs. In a major announcement that reflects its hiring strategy for the future, Indian IT giant Infosys will set up a $21 million regional center in Hartford, Connecticut, and will hire 1,000 employees over a period of four years. In an official announcement, Infosys said the center will have a special focus on insurance, healthcare and manufacturing. It added that the Connecticut Technology and Innovation center will serve as the global hub for Infosys’ InsurTech and HealthTech efforts. Infosys said the plan to set up a new innovation center and the decision to hire “local talents” is part of the company’s efforts to shrink the IT skills gap in the marketplace. The new announcement falls in line with the company’s earlier statement that it will open four new technology and innovation bubs in the United States and hire 10,000 skilled American workers over a span of two years. Infosys is confident of addressing specific client needs in key industries such as financial services, manufacturing, healthcare, retail, energy and more through these hubs. “Infosys is committed to hiring 10,000 American technology workers over the next two years to help invent and deliver the digital futures for our clients in the United States,” its then-CEO Vishal Sikka, said in 2017. The first Technology and Innovation Hub of Infosys was inaugurated in Indianapolis, Indiana. The company has already announced a Technology and Innovation Hub in Raleigh, North Carolina, and a Design and Innovation Hub in Providence, Rhode Island. 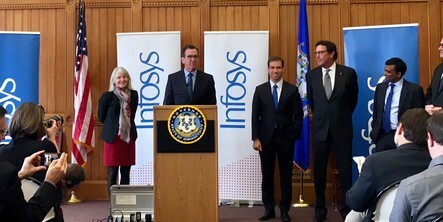 “I am thrilled that Infosys, a global information technology company, is making Hartford one of four innovation hubs in the United States,” Hartford Mayor Luke Bronin said. “This announcement is huge for Hartford and for Connecticut. As part of the company’s establishment of the hub in Hartford, the Connecticut Department of Economic and Community Development (DECD) has announced that it will provide up to $12 million in grants after certain job creation milestones are met through Governor Malloy’s First Five Plus Program.